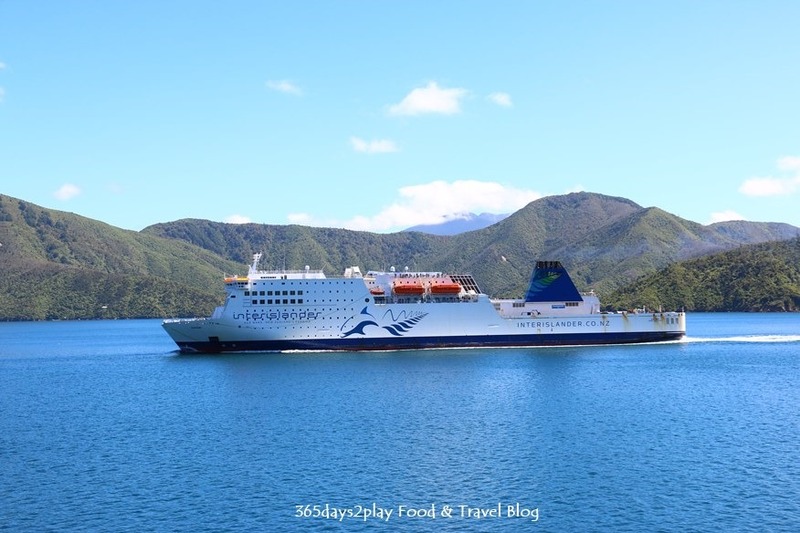 The ferry ride through the Cook Straits is a touristy activity in its own right. 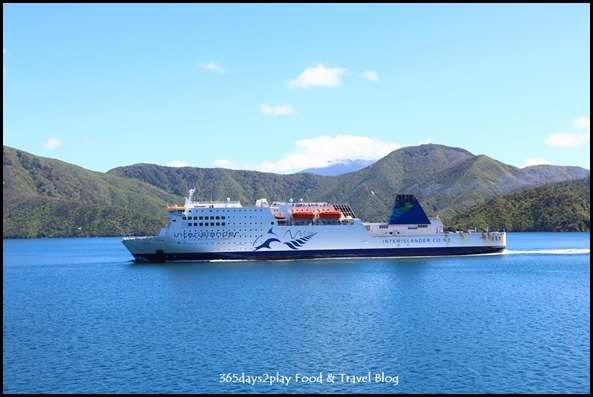 The 1st half of the journey from Wellington is pretty uneventful, however once you reach the Queen Charlotte Sounds (yes the ferry travels through it! ), it’s all cameras on deck clicking away! I absolutely love the feeling of the wind blowing in my hair, and the vast expanse of sea and picturesque views. The tickets are not too expensive too (roughly NZ$55/pax/one way), considering this is both a means of transport as well as means to sight-see. The car-rental office is just a few hops away from the Picton ferry terminal, and we got a nifty white Toyota Corolla from Avis which served us very well (was sad to say goodbye to it at the end of the trip!). 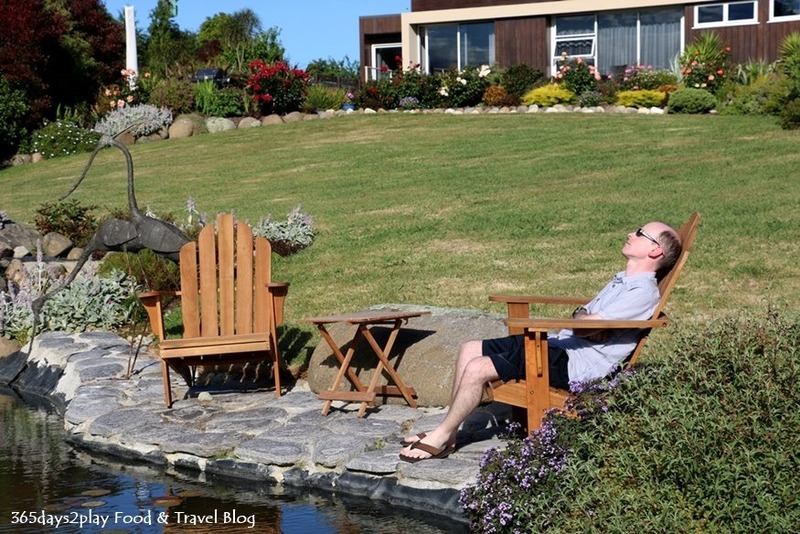 We headed straight for the Nelson region, where we had booked our lovely hotel, making stops at the Makana Chocolate Factory and Vines Village. If you don’t want to create a hole in your pocket so soon, do not stop at the Makana Chocolate Factory! When we stepped in, we were given samples of this heavenly caramelly hazelnut chocolate confection. It was utterly love at first taste and we forked out $50 for 2 boxes of it without too much hesitation. The Vines Village is another good pit-stop, as it has a number of shops selling produce from the region, ie wines, olive oils and jams. Jams, chutneys and honeys are unfortunately my weak spot, and with the increase in luggage allowance to 30kg per pax for Singapore Airlines, I was already mentally prepare to be shipping bottles of these back to Singapore. 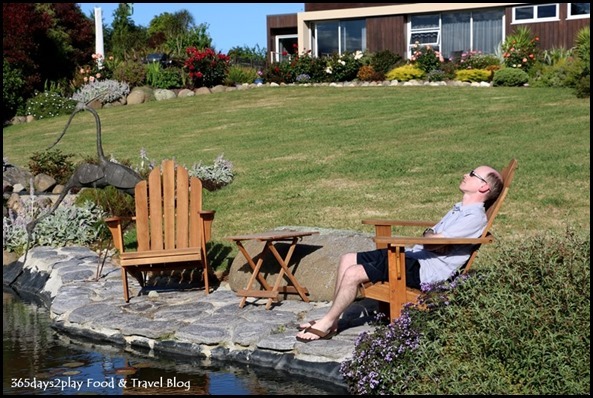 Although Almyra Waterfront Lodge is a 45 minute drive from Nelson city, and a little heavy on the pockets at about $400 per night for this time of the year, we were so smitten with how the place looked that we just had to stay there. It would be our base for 2 days to explore the Abel Tasman area. Our 2nd accommodation was back at Picton, a more modest looking Grandvue Picton Bed & Breakfast, but boasting superb views of the Queen Charlotte Sound and just a 1 minute drive down the hill to the Picton town centre. I had originally planned a jammed packed itinerary for the 4 days in this region, ranging from kayaking, trout/salmon fishing, horse riding, cruises, and walks, but upon the advice of Fiona of Almyra Waterfront Lodge, we decided to take it at a much more leisurely pace so as not to be driving from one place to another like a maniac. The places may look nearby on Google Maps, but one has to remember that mountains occasionally pop up between the pit stops. In the end, we did two beautiful cruises. 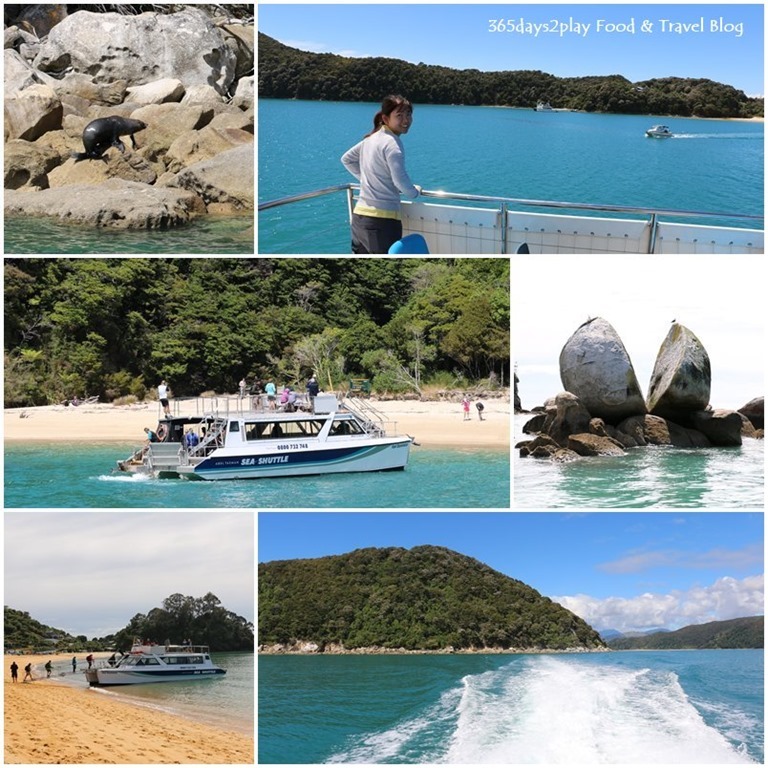 We did a two hour cruise up the Abel Tasman National Park with Abel Tasman Sea Shuttles. Managed to sight some seals fighting (or perhaps playing) which was a real treat. Not another tourist perving on me sitting on my eggs! We also did the Sunday Afternoon Cruise through the Queen Charlotte Sound with Beachcomber Fun Cruises. Unlike the ferry, the boat stops at numerous islets to drop off or pick up passengers (or mail and packages on the weekdays). You gotta be amazed at the people living in these isolated locations where transportation out is via boat. Surprisingly, I had 3G reception at least half the time. I couldn’t imagine not being connected to the world, but then again, wasn’t that what life was like a mere 20 years ago? 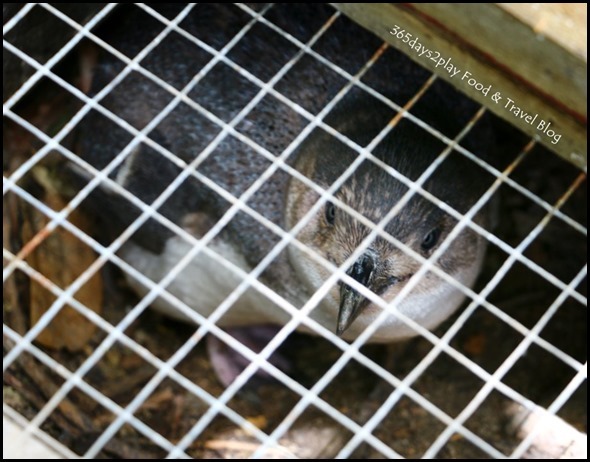 There are also 2-half hour stops at Motuara Island (bird sanctuary) followed by Ship Cove (where Captain Cook landed). 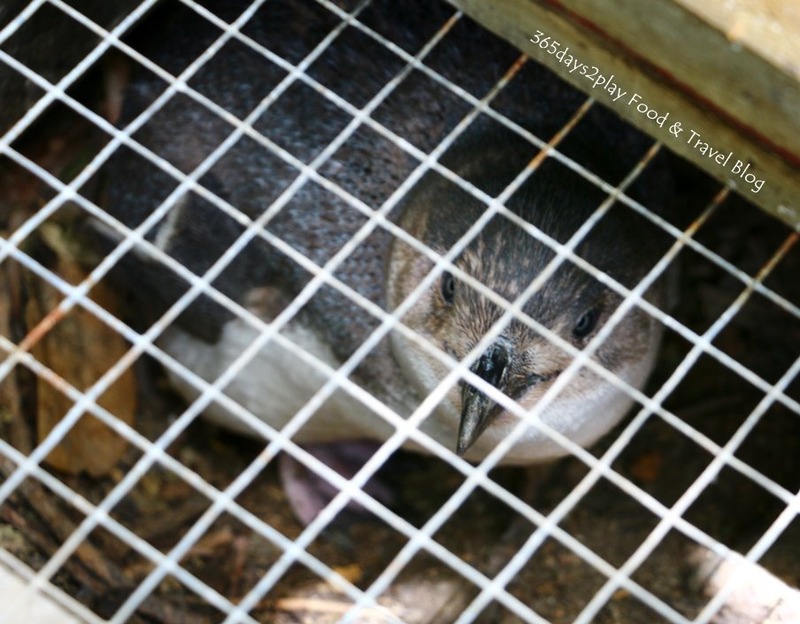 One of the highlights of the trip was chancing upon a Little Blue Penguin in a nesting box, just patiently staring at us and waiting for us to close the viewing cover! Not the most glamourous of shots but am really proud that I managed to suppress my fear of heights to ride this horse! 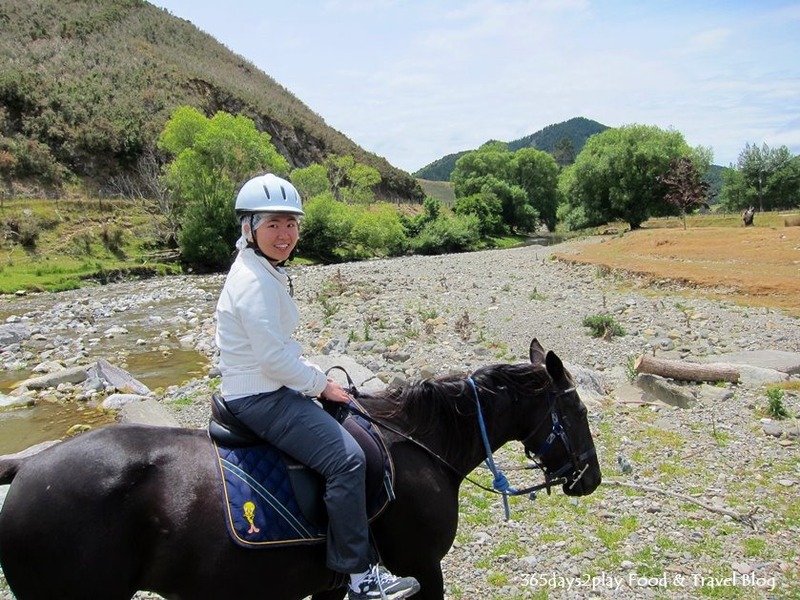 We also checked out the famous Nelson Farmer’s market and did a spot of horse riding. The Partner was familiar with riding horses as he did an equine course in his younger days. It was something I have been wanting to do for the last 10 years ever since the 1st Pure New Zealand ads caught my eye. Being a scaredy-cat who is terribly afraid of heights, being seated high up on a horse with nothing to hold on to (the saddle doesn’t count for much!) is really no joke! I was told to tell the horse that I’m the boss, but let’s be frank, I failed miserably. And it really isn’t funny when the horse decides to eat some leaves off the low branches of trees, resulting in the rider smashing through them. Still, it was an amazing feeling riding through the farmland and up on the hills, one that I might want to repeat again some time soon. Stay tuned for more pictures posts on my trip to New Zealand.